Most of our rings come in raw form from the caster totally unfinished while some only require polishing. However, most will require reworking of some kind, usually sizing or reshaping, not to mention setting stones. Regardless, every job ends with the ring being polished in one way or another. Most of our rings are hand-polished using a polishing motor as below, and then cleaned. 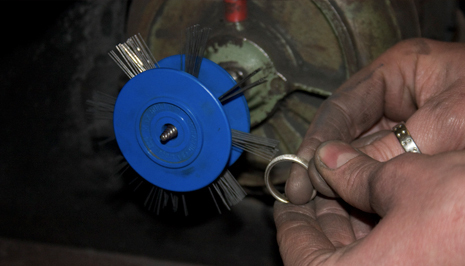 Many rings are given a preliminary polish with a barrel polisher, before additional work is done to the ring. The rings go into the barrel, along with a solution of water and cleaning compound, and some stainless steel shot different size balls and spiky shapes. The barrel rotates and the solution is mixed around, making the rings bounce off the steel to end up with an even finish. Here a ring is being polished on a polishing machine or "buffer." 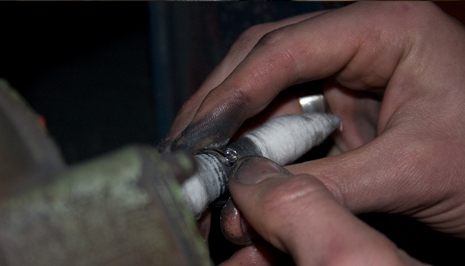 Swan's down is used to add the final shine to a mirror finished ring. 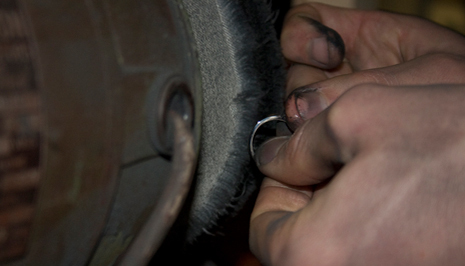 Scotchbrite, Beartex or frosting wheels are used to apply matte and satin finishes to a ring. Needles are used to create a stardust finish, the needles are attached to the wheel and spin freely - creating an even, sparkling surface as they hit the ring. Finger felts are used to polish the insides of rings. A thin "dental" brush can be used to get into the crevices where a ring has intricate work, like diamonds set, to ensure that the entire ring is properly polished and shiny. After multiple stages of using finer and finer polishing compounds and when the jeweler is positive that there is no more dirt, dents, scratches, porosity or any other blemishes the ring is ready for its ultrasonic cleaning. Then, after a final inspection and packing it is ready to be sent out to the customer. Our workshops spend most of their time making custom designed jewelry for customers. If you have something in mind that you can't find on the website please contact us. Take a look at our custom ring design service page and let us know what your ideas are!